This time around, even my morning journal pages feel sluggish and repetitive, with me repeating a seemingly endless list of undone tasks and to-dos: a litany of “shoulds” and “gottas.” When you’re in the midst of the blog blahs, you read old blog posts and journal entries with a sense of amazement and even jealousy: Who was I when I had the time and inspiration to write long and insightful essays? At the moment, saying anything profound or even positive seems ambitious and unattainable. But, I’ve been writing (and blogging) long enough to know that even the worst case of blog blahs eventually passes: you just have to wait it out. And the best way of waiting, of course, is to keep writing, even if what you’re writing seems inane, insipid, and uninspired. Are to-do lists and whining rants fun to read? No, which is why I write them in my journal and mercifully don’t share them here. Are to-do lists and whining rants fun to write? No, but sometimes you have to flush out the gunk that’s causing your creative clog. So, here is a post that feels both clogged and gunky: an attempt to shake off the blahs by posting something, anything. I remind myself of something Gary Snyder said when I saw him speak back in 2010: “You never know if you’re going to write another good poem.” When you’re in the midst of the blog blahs, you begin to wonder if you’re ever going to write another decent blog post, another decent journal entry, or another decent anything, but the only way out of that slump is to write your way out. Flickr is currently down, so I’m posting this entry as-is, with only one accompanying photo. 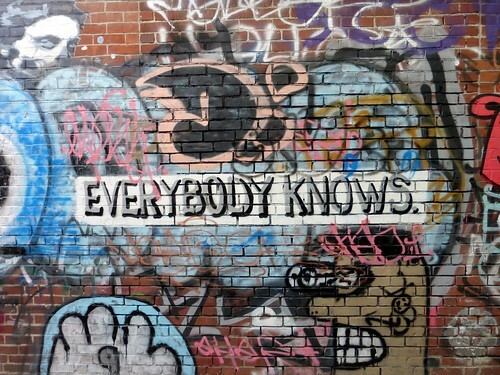 I don’t know what it is that “Everybody Knows,” so I’ll leave that to you to figure out. “Everybody Knows” is a Leonard Cohen song I would guess and it goes pretty well with the Blahs. Appears that you have a bit of synchronicity going there madame! unfortunately prophetic in leonard cohen’s case with his accountant embezzling all his savings which were considerable ! i think blog writing like your s and mine which is a literary form raises questions about the problem of a huge energy going out for the benefit of others that has a huge financial cost with no return . .
or rather the return is simply the processing that writing does . .
your experience in kwan um zen will have, no doubt brought you face to face with the problems of volunteerism, i feel that all the teachers i met without exception including toni packer would have been better to have never come across zen . .
your life is burning away rapidly, i think that’s some sort of undercurrent you a r e a w a r e o f ! . .